Boating is a challenging leisure activity. “And the demand for support and extra comfort is growing”, highlights Björn Gabler from the SOUTH COAST BALTIC Marketing Initiative. One of the reasons: The average age of German boaters, by far the largest group of guest boaters at the southern Baltic Sea coast, is increasing significantly due to the demographic change. But also other kinds of boaters are in need of special services. 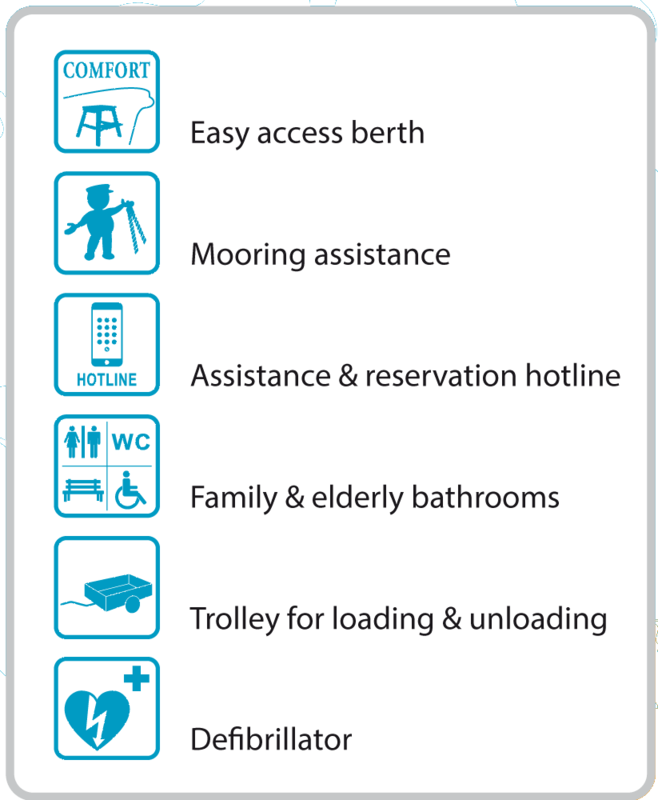 “We conducted a study to identify facilities and services that can make the stay in the harbours more convenient for elderly boaters”, explains Björn Gabler, “When we had a look at the results, we realized that the identified measures may benefit other customer groups that become more and more important, too.” Families with small children, for example, appreciate wide bathrooms with sitting possibilities or a berth close to sanitary facilities as much as elderly people. Clear signage at the port entrance or mooring assistance do not only facilitate boating for people with physical impediments, but makes it easier also for beginners or charter guests. “Serving our present costumers in a better way is an investment into making boating more attractive for newcomers, at the same time”, concludes Falk Morgenstern from the Baltic Sea Resort in Kröslin, which was among the first ones to offers elderly-friendly berths. In order to enable “easy boating for everybody”, the SOUTH COAST BALTIC Marketing Initiative sets up four pilot harbours (Baltic Sea Resort in Kröslin, NorthEast Marina Szczecin, Marina Darłowo, Small Boat Harbour of Šilutė). Those will offer and test different services and facilities during the season 2019. “We are in particular curious if the new “assistance & reservation hotline” finds interest and our “easy access berths” satisfy our visitors”, explains Marta Borowska from the NorthEast Marina in Szczecin. On the basis of the experiences from the pilot season, guidelines will be elaborated in the next step to motivate and help other harbours in establishing similar offers. This includes to servey if the different target groups, like elderly boaters, families with children, charter guests or beginners, find the new offers helpful. “We will ask the boaters for their opinion on the services and facilities that we provide in our pilot harbours”, announces Björn Gabler. “It would be great if as many boaters as possible will test the services and give us their feedback”.